Oct. 11, 2018, 3:57 p.m.
Woah, hello again! I'm a little annoyed with myself for not realizing activities were back. I'm slacking on my idol activities. Name's Queenie! Passion and Cute P, for the most part. I'm a 25yo gal and super in love with all my cute idol girls. [email protected] and Aikatsu are my two main idol franchises, but definitely not the only ones. 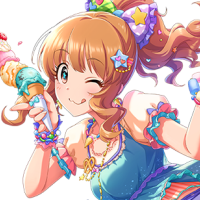 I have too many best girls in Cinderella Girls to count, mostly Passion idols, but right now I'm ALL about my cool beauty, Aikawa Chinatsu. My wife. My beautiful bespectacled wife. The goddess of lips. One day we will be blessed with her SSR and I will ticket the heck out of it-- and then maybe ticket her wife Ai's SSR as well-- and cry over it. Every October I try to draw some Halloween [email protected] art. (Last year was Akane, and the year before that was AnKira). This year I'm thinking of giving Chinatsu some love. Or maybe drawing Nina (my daughter, my girl, the light of my life) again.